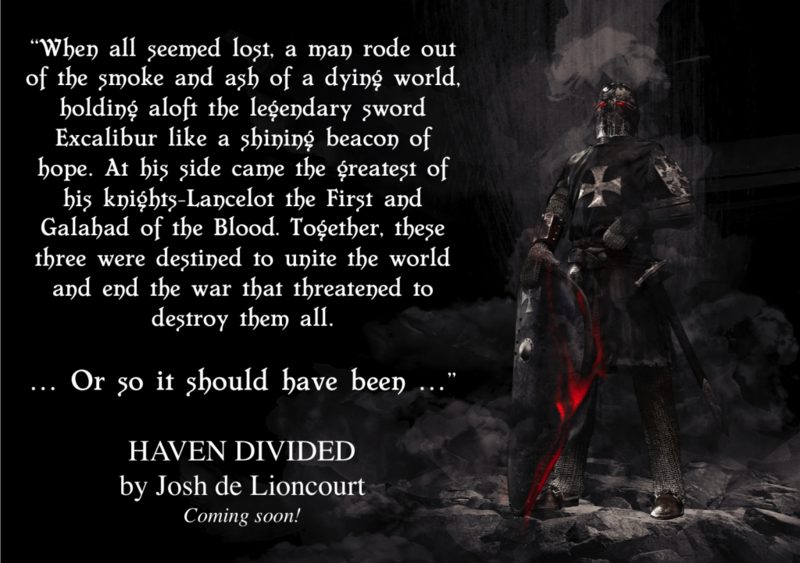 We finally have the joyous occasion of celebrating a long-awaited release: Haven Divided by Josh de Lioncourt! 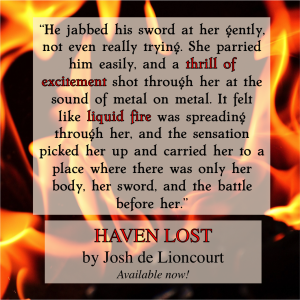 If you haven’t read Haven Lost and its short prequel Harmony’s Song, now is the time to grab them—they’re free starting today through August 3! Haven Divided, the second book in The Dragon’s Brood Cycle, launches tomorrow, July 31, so grab these freebies while they’re available and start reading. Story ideas are like autumn leaves. They swirl and dance in an October wind, fleeting, colorful, and almost always beautiful. You can reach out to them, try to touch them, but most drift away, barely brushing your fingertips before they’re gone. If you happen to catch one, it is as likely as not that you will crush it before you’ve scarcely had a chance to examine it. Ideas are fragile things. Every now and then, though, you snag a whole fistful of them, only to find they aren’t distinct stories at all, but merely fragments, puzzle pieces that might form something even more beautiful—if you can figure out which ones fit together and where. My new novel, Haven Divided, is constructed very differently from its predecessor in The Dragon’s Brood Cycle. There are four main POVs (and a couple of minor ones) that the story moves between. Keeping track of that many threads is challenging all on its own, and that’s before you factor in your job as the writer to make sure you don’t overwhelm or fatigue your reader. Many seasoned authors tell new writers to just keep getting words down onto the page (or screen) and not worry too much if they’re any good. “That’s what rewrites and editors are for,” they say. In fact, NaNoWriMo is practically built on that entire concept, and a little more than one-third of my first novel Haven Lost was written during NaNoWriMo. While the idea is a sound one that has certainly worked well for many, it has never been what works for me. In general, I write a chapter or scene, then go over it at least once, sometimes twice, trying to see it from my reader’s perspective. I edit and revise; I condense superfluous sections and add color to others. I don’t linger long over it, but I let it settle in my mind and become something independent of my imagination, something that can stand on its own. And then I move on to the next chapter. This strategy was absolutely essential when juggling multiple POVs, and in fact ended up expanding. Whenever I would return to a character whose POV I hadn’t written in a while, I went back through his or her previous section, allowing their perspective to become my own as a reader would. Only then would I resume their tale. This made, I think, for a much more cohesive story, and keeps the reader fully immersed in each character’s world. When done well, a reader can often identify whose perspective a chapter is entering before the text itself even makes that explicit, because each POV should carry the flavor of its protagonist’s voice. Around the halfway mark of writing Haven Divided, I accidentally stumbled into another important part of the process, at least for me. I’d needed to put the book aside while working on another project for an extended period of time. When I returned to it, I went back and reread all that I had written so far, and I realized that the pacing could be better. Before continuing, I rearranged the first half of the book, establishing a rhythm to the story and POV changes that improved the way in which the story unfolded from the reader’s perspective. Never be afraid of moving things around. Stories and plots, just like the language itself on the page, have a beat and a tempo that matters, even if your reader is not consciously aware of it. Once I’d made those changes, maintaining that rhythm for the remainder of the book became natural and effortless, and the book itself was far better for it. Sometimes it seems that the puzzle pieces fit one way, when in fact, that bit of sky is over there, not over here. All of that is a long way of saying this: when the evenings come sooner and the first chill and smell of woodsmoke comes to you on the autumn winds, reach out for the leaves that flutter by and try to catch a few. See if they make a picture, and don’t be afraid of rearranging them a thousand times over. Even if you crush one or two, there are always more—and they are all beautiful. 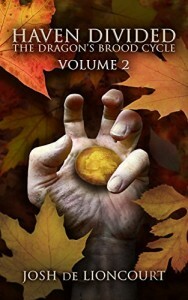 This entry was posted in Book Launches, Writing and tagged fantasy book launch, fantasy book recommendations, fantasy book sale, free fantasy books, harmony's song, haven divided, haven lost, josh de lioncourt, nanowrimo inspiration, the dragon's brood cycle. Bookmark the permalink.